An alternative to a heat lamp. Less fire risk. A heating plate simulates a hen keeping chicks warm beneath her feathers. Warms up to 50 chicks. Uses only 66 watts/hr. Chicks stay warm by contact with the warm underside of the plate. The bottom-side surface of the heating plate will reach approximately 125 degrees when fully heated. 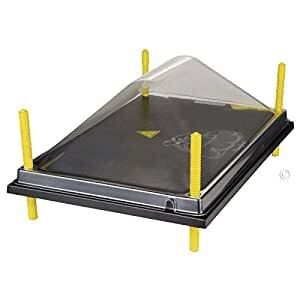 We strongly recommend using the cover, as it prevents older chicks from perching on top of the plate and keeps top of plate clean. An alternative to a heat lamp that uses much less electricity. Uses 66 watts/hr. 16″ x 24″ heat plate accommodates up to 50 chicks. The bottom of the plate will reach approximately 125 degrees when fully heated. Allow the plate 1 hour to heat the unit before placing the chicks under it. As the chicks grow, increase height of the plate above the bedding with the adjustable push-button legs. Plate is most effective when chicks can just touch the plate, especially when they are newly hatched. Heating plate is made of ABS plastic and polyurethane insulation. Requires 110 volt outlet. Has 70″ cord length. 1 year limited warranty on electrical heat plate unit. I have 3 of these for my kids 4-H hatching projects. In the spring, we have 3 brooders going. 2 with the 12×12 and one for the “Teenagers” is the 16×24. Love them all. I think these help chicks “harden off” better than the ever-heating, fire hazard heat lamps. The chicks decide how much heat, and when, they want it. Much like they would with a mother hen. In fact, my friends call these “electric hens” and it seems an appropriate name. My chicks didn’t come when they were supposed to. In fact they didn’t get here til we were in a heat wave! So I didn’t have to keep heat on them for very long. Which was a GOOD thing, because, altho these did in fact “work”, it seems to me these chicks out grew them WAY before they should have. Maybe I just don’t know how close to the chicks they should have been. But I have to wonder, if it was cold out, if the chicks would have outgrown these before they out grew the need for extra heat? I don’t know. Anyway, these were great for new baby chicks. I would recommend them. This is the second one of these I have purchased and I swear by these. They are amazing and the chicks know where to go to stay warm. I haven’t lost a chick since starting to use them. Before, I was using heat lamps and they were either dying from being too hot or too cold. Everyone needs these. They are so worth every penny! Thank you for great quality! This works!!! I was so happy with how all of the chicks, keets, and poults would lie under this to keep warm. It is so much better than a red heat lamp. I felt more secure about this not causing any random fire like a heat lamp might. I did not have to use any kind of a temperature regulator with this since the chicks can just scoot out if they are too warm. No worries this only warms to about 100â so the chicks can’t possibly be over heated. I’d highly recommend this to anyone who is going to brood chicks often. This thing is great. Iâve been hatching and brooding hundreds of birds a year for five years. Right now itâs brooding the turkeys as they hatch. This is much simpler than managing heat bulbs and I will be getting two more. Itâs packaged well, easy on the eyes, looks well built. I unpackaged it, plugged it in, and after about 30 minutes, the heating plate is still cold to the touch. The red light indicator shows that the unit is heating. I will give it another 30 minutes and update review. Edit: Itâs working. I wonât have my baby chicks till Feb 15th. It took longer than expected to warm up. I will F/U after the babies arrive for a like chick test. This thing is amazing. I wish I bought it sooner. So glad I bought it. My chicks are so cute running under it for warmth but coming out to eat. No more heat bulbs ever! Had a lot of chicks die. Not sure if I got a bad batch or if this works right. I took it out and threw the lamp back in and the deaths stopped.